After the policemen had sodomized the bus driver with a broomstick, and after one of the officers had sent a cell-phone video of the attack to other bus drivers in downtown Cairo to make clear that the cops could do as they pleased, and after someone had given the video to Wael Abbas, who posted it on his blog, something unusual happened -- at least, something unusual for Egypt. It was an extraordinary moment, this sudden burst of justice back in 2006. Few have dared to point their fingers at police wrongdoing in Egypt. And it's even rarer that the culprits have been punished. The tumult that has rocked Egypt this winter was clearly sparked by the Tunisian revolution. But the Egyptian uprising didn't begin on Jan. 25. It was rooted in the waves of workers' strikes and protests; the explosion of the Internet as a rallying megaphone for dissent about government abuse, corruption, and a vampire economy where a few flourish while many struggle; and a growing willingness by reporters, writers, and human-rights groups to tell the truth in the face of great risks. After all, hadn't the regime brutally slapped down bloggers and anyone who dared to stick out his or her neck? Hadn't it crushed and humiliated political opponents? Hadn't it cowed its college graduates into accepting high unemployment rates and menial low-wage work or into leaving the country in order to land a decent job? Nobody counted on these disparate groups -- including Muslims and Christians -- coming together in the streets. Nobody calculated the emotional impact on the Egyptian people when it became clear that the republic of fears and lies was no longer almighty. And nobody counted on unsung heroes like Wael Abbas. Over the past three years, when officials denied attacks by groups of men on young women in downtown Cairo, Abbas provided videos that showed the opposite. He put up videos depicting police brutally attacking demonstrators. Nothing in his background suggested that Abbas would become an inspiration for a generation of bloggers. (Cairo's "official" newspaper, Al Ahram, called him "Egypt's most well-known blogger.") A recent college graduate from a working-class family when I first met him in 2007, Abbas knew his way around the Internet. He had friends who did as well. But what set him apart was his need to tell the truth that wasn't being told and his unwillingness to give up. Others quit when things got rough. Abbas didn't. He seemed emboldened by the impact he was having. The arrival of the Internet and the explosion of Egyptian bloggers, he said, created the "genie" that the government couldn't put back in the bottle. Abbas paid a price for his truth telling. Enemies have tied him up in lawsuits. He has searched for steady work, plainly hindered by his reputation as a dissident. Several years ago, I urged him to consider work elsewhere, but he insisted he couldn't leave Egypt. He steadily kept up his blog. When the uprising began this January, he showed some of the first pictures of injured protesters in Alexandria. After his brief detention by police in February, he told ABC News that he had gone into hiding and that many of his friends had been seized by police. Over the past couple of years, Abbas was far from the only one posting police misconduct online. Last June, Khalid Said, a young businessman, died at an Alexandria cafe. The police claimed that he had suffocated from a plastic bag of marijuana. Two autopsies backed up the police's claims, authorities declared. Eyewitness accounts, spread via the Internet and eventually to the Egyptian newspapers, told a very different story. They described how the 24-year-old had been dragged out of the cafe and beaten by police. They said he had been targeted by police allegedly because he had posted a video online that showed officers sharing the results of a drug bust. Yet the most compelling items posted online of what happened at the cafe were photos depicting someone who had been so badly beaten that his face was grotesquely contorted. Thousands joined the Facebook page protesting Said's death. Demonstrations broke out in Alexandria and elsewhere. The government quickly charged the two police officers named by witnesses not with murder but with unlawful arrest and excessive use of force. 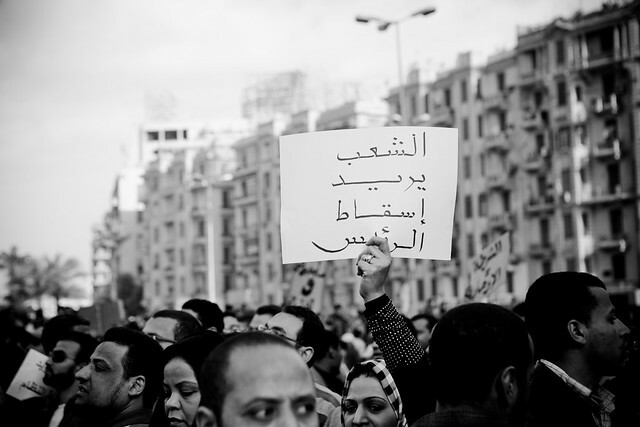 While most of the wrongs recounted on the Internet over the past couple of years have not been righted, they have been part of the process of building the movement that's taken to Cairo's streets this winter. When workers staged protests in 2008 in al Mahala al Kubra, a grim textile-manufacturing town, a Facebook page rallied more than 100,000 supporters across the country. That spurred the formation of a group known as the April 6 Youth Movement, a loose collection of tech-savvy youths, intellectuals, workers, and many from the vast ranks of the unemployed. Their online success encouraged them to join in a call for a national strike in 2009. Hardly anyone showed up, however. The organizers blamed the fizzled turnout on a government crackdown and tight police presence. Hamalawy's photos have shown the faces of Egyptian workers as they've overcome their fears to confront their employers -- and, at times, their government. Over the past six years, more than 2 million workers have joined in more than 3,300 occupations, demonstrations, or other forms of protest -- a development without precedent in Hosni Mubarak's Egypt. In nearly all cases, they were protesting on their own because their unions are shells for the government. On occasion, they have won their battles, with the government conceding just enough to deflate the confrontations. The workers have protested lethal workplace conditions. They've protested a minimum wage for beginning workers that was stuck at $7 a month for more than 20 years. They protested the government's broken promises of economic reforms. Their biggest victory came last autumn when the government, after fighting lawsuits from labor and human-rights groups, grudgingly boosted the wage base to about $70 a month, still far below what workers say they need. That may seem like a heaping increase. But state officials last November told Al Ahram that a family of four needs to earn more than $120 a month to escape poverty. And for hundreds of thousands of workers in the underground economy, there are no pay rules, no benefits, no workplace protections. They get whatever the boss gives them. That is why about at least 40 percent of the nation lives on $2 a day and why one out of five Egyptians does not earn enough to meet his or her basic food needs, according to a 2008 United Nations Development Program report. Many workers have slipped further into despair as privatization efforts have trimmed already low benefits and wages, taken away their slim hopes of job security, and fed into a strong sense of outrage. Last summer, the workers' fury reached a crescendo as disgruntled employees from one factory after another gathered in front of the Egyptian parliament on one of Cairo's busiest streets. Such an in-your-face display of angry workers in front of the government was unprecedented. The demonstrators slept on the sidewalks for days on end, often dressing in rags to show their plight. One broiling day last year, I hung out with workers from one factory, who pounded drums and banged rocks on police barricades to draw attention from the motorists passing by. "We are not going to fight or make trouble," vowed Khaled el Shishawy, a short, muscular man in his 40s who had worked at a factory that had shut down, and was the protesters' acknowledged leader. To calm an earlier protest by the same workers, the government had promised months earlier to help them get severance payments. But nothing happened, so the workers were back on the streets. The next day, police and government thugs swept all of the demonstrators away from the parliament building, saying that the workers had armed themselves and were violent -- claims discounted by Egyptian journalists who had been on the scene. When I met with el Shishawy and leaders of other worker protests several days later, they were not discouraged at all. They swore they would carry on. The problem was their whole effort was so new they were not sure how to organize themselves. They wanted to tell the world about their struggle, but they had no idea how to do so. Informing the world about what's happening in Egypt hasn't been easy or safe even for those with the right skills. Novelist Alaa al Aswany tried for years to tell the story of the government's corruption and abuse and its blindness toward the massive numbers of poor. State censors blocked the publication of nearly all of his books, and he was planning to leave Egypt. One book, however, got through, and a publisher took a chance on it. The novel, The Yacoubian Building, set sales records in Egypt about a decade ago and became a widely popular movie. The story is a melange of Egyptians' woes. It tells of people so poor they live in shacks on rooftops, of a ruling party that thrives on kickbacks, and of police torture that drives the young into the arms of Muslim extremists. Because he could not rely on his income as a writer, al Aswany kept up his job as a dentist. Even after the book's success, he kept his practice, in a decrepit office building not far from where I lived in Cairo's Garden City. When I visited him several years ago, he was headed for one of the nighttime salons he held weekly for young writers. But the salons had run into problems. The government was pressuring restaurants to deny him space to hold his meetings. Al Aswany constantly had to search for new places. For years, al Aswany had written a column for Al Destour, a small, struggling leftist paper. Last year, he began writing for El Shourok, a new, independent newspaper that is closer to the political center. He stopped writing last fall, however, according to the Committee to Protect Journalists, after the newspaper's bosses warned him and another columnist about "external pressures" to tone down their content. His column vanished at about the same time that Ibrahim Eissa, a long-term journalism gadfly who has faced dozens of court cases under the government's press laws, was fired as editor of Al Destour. The new owners of the newspaper said it had nothing to do with his views. But Eissa insisted that he had been fired after he refused to kill an article written by Mohamed ElBaradei, the former head of the International Atomic Energy Agency, who was building up his status as a leader of a growing political opposition. During the past year, though, incidents of censorship and the repression of news and opinions have themselves become more of a topic for public discussion. Salama Ahmed Salama, a columnist for Al Ahram, weighed in with his view of Eissa's firing. "An invisible hand is in control of the media," he wrote. "The invisible hand determines the degree to which freedom of expression and publication is permitted. This invisible hand uses the owners of the media, forcing them to shut down mouths that talk and break pens that have gone far." What's notable here is that Al Ahram is not only the nation's largest daily newspaper but the government's mouthpiece. In the deadening tradition of Arab government-run newspapers, it is rare not to see the face of the ruler -- Hosni Mubarak -- on the front page greeting some dignitary. News that makes the government look bad either doesn't exist or appears as a small item way back among the advertisements. Salama's is a brave and unusual voice. To be sure, amid competition from TV and new papers, Al Ahram has struggled to reshape itself and loosen its authoritarian demeanor. But its role as the government's voice from on high to the masses still pervades many of its workers' thinking. I was reminded of this during a training session I put on last year for Al Ahram staffers. The goal was to create issue-oriented stories that draw in readers by first telling about particular persons or describing a particular scene. This is long a tradition in the West but not in government-run Arab newspapers that like to tell its readers what to think. Much to my pleasure, the writers and editors embraced the concept. For their homework assignments, many also came up with compelling stories about poor people struggling to survive in Cairo, and the group seemed pleased with the results. But at the end of our meetings, a young editor, who had seemed enthused by the work, complained that the concept didn't fit his newspaper. "This is not the way we Egyptians think. We don't emphasize the individual or put the individual first," he said. That's no longer entirely true, however -- not since Al Masry Al Youm (Egypt Today) appeared in 2004, followed by one or two other independent newspapers. Al Masry Al Youm doesn't belong to the government or to a party or a religious group as do most Egyptian newspapers. It has emphasized features and investigative reporting. And it has turned loose young reporters, who have pushed back barriers never challenged before. During this winter's uprising, it reported accusations that thugs captured during looting had cards identifying them as police. "The 25 January 'Day of Anger' was a turning point for mass politics under Mubarak as thousands of demonstrators broke a fear barrier that for decades had kept Egyptians off the streets out of concerns for their safety. Those days are coming to a close."